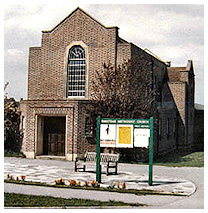 Banstead Methodist Church is situated in The Drive, to the west of Banstead village and next to the A217 (the Brighton Road). Behind the main buildings are the headquarters of the Scout Group sponsored by the church. Visitors to the church may park in the large car park opposite the front of the church. The history of this church dates back to 1932 when some members of the Methodist Church at Burgh Heath met to discuss forming a church in Banstead. A plot of land had already been purchased in 1925 for the sum of £450. 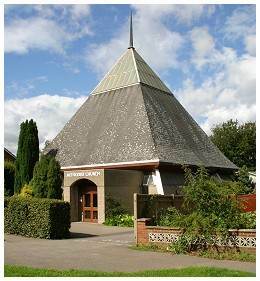 The church at Burgh Heath had a missionary outlook and helped raise funds over the next few years, not only for the erection of a church at Banstead but also a church at Cheam. Meanwhile, the fledgling church began to hold services in the front room of a house in Green Curve, but when that became too small they moved to a room above the Hillcrest Tea Rooms in Eastgate. The stone laying ceremony for the original church took place in September 1934 on one of the wettest days that Banstead had experienced. The church was finally opened on Saturday 9th February 1935 by Lady Stamp. The preacher at the opening service was Rev. Dr. Scott Lidgett. Unfortunately, due to structural problems, the building had to be demolished and was replaced by the present one in 1972. At the rear of the church is the hall from the original church plus a much larger one erected in 1961. Methodism is a Christian denomination founded by John and Charles Wesley in the Eighteenth Century.